Basil is one of my favorite herbs, everybody at home loves the flavor, we love it in the classic Basil Pesto, in our pasta, sandwiches, risotto or in even a simple fried rice. 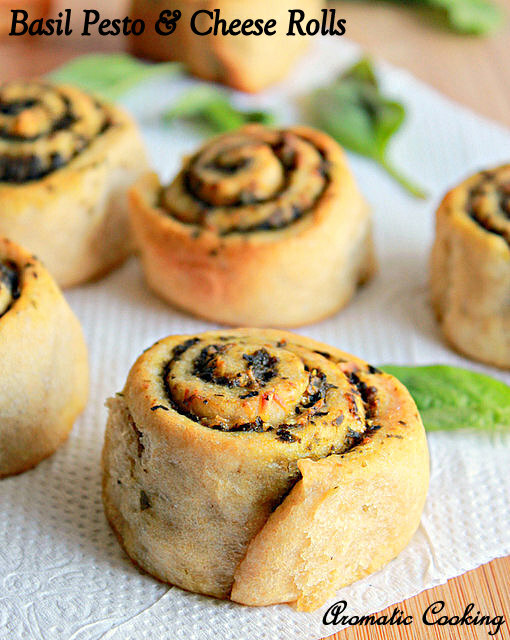 I have been thinking of baking with it too, especially these rolls and braided bread with Basil Pesto had been on my list for a long time now. Most of the time, I'll be able to get only a small packet of basil which would not be enough for making the rolls, and even if I have more of it in hand, it usually ends up in a pasta or risotto. 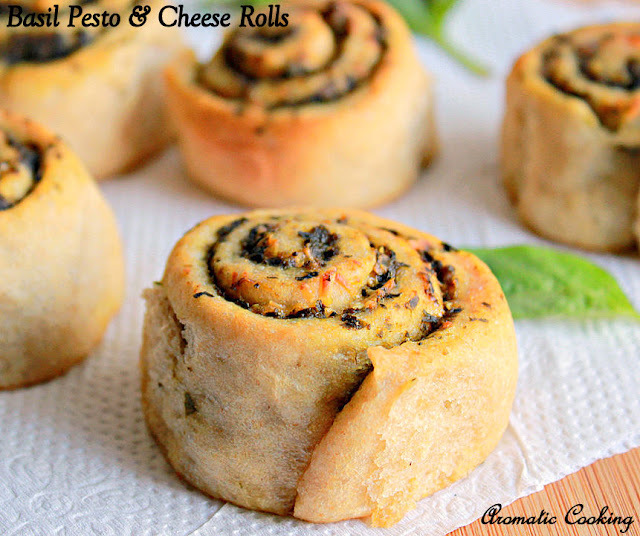 This time, I bought them specifically for these rolls, made the pesto and finally made them. I am not going to say how delicious and flavorful these rolls were, anybody who knows and likes basil will surely love this. I have used homemade Basil Pesto, but you can make your own or buy the Pesto. So the next time you buy Basil or Pesto, do try these rolls and for those ( in India ) who are not able to find basil, don't lose heart, you can try the rolls with coriander chutney, of course the flavor will be different but it'll still taste delicious..
Take the yeast, 1 teaspoon sugar and add 1/4 cup of hottish, wait till it the yeast bubbles up, then add the remaining 2 teaspoons of sugar, salt, oil, another 1/4 cup water followed by both the flours. Bring them together and make a soft dough, knead for about 10 minutes, apply some oil, cover and leave it for an hour till the dough has doubled. Once the dough has doubled, roll it out into a rectangle ( about 1/4" to 1/2" thick). Spread the pesto all over and then sprinkle the cheese. Now roll it tightly from one end to other as shown in the picture. Slice the roll into 16 equal pieces and arrange them in a greased baking dish, cover it and leave it to rise for another 20 to 30 minutes till the rolls puff up as shown. Then bake them in a preheated oven at 180 C for 25 to 30 minutes till the top turns golden. Remove, brush the top with some warm milk and serve them warm. Oven timings may vary, so keep an eye after 20 to 22 minutes. If you want, you can use only all purpose flour, it's totally up to you. Depending on the flour and the humidity, the amount of water needed to make the dough will be a little more or less. This looks very good. The filling looks delicious. They turned out bakery perfect, Hema.